With the release of the ALP690, Lectrosonics is bringing you the latest addition to the company's line of ALP Series skeletal remote antennas, designed to improve wireless microphone reception and solve signal-dropout issues with wireless microphone receivers or base-station transmitters in location or studio production. 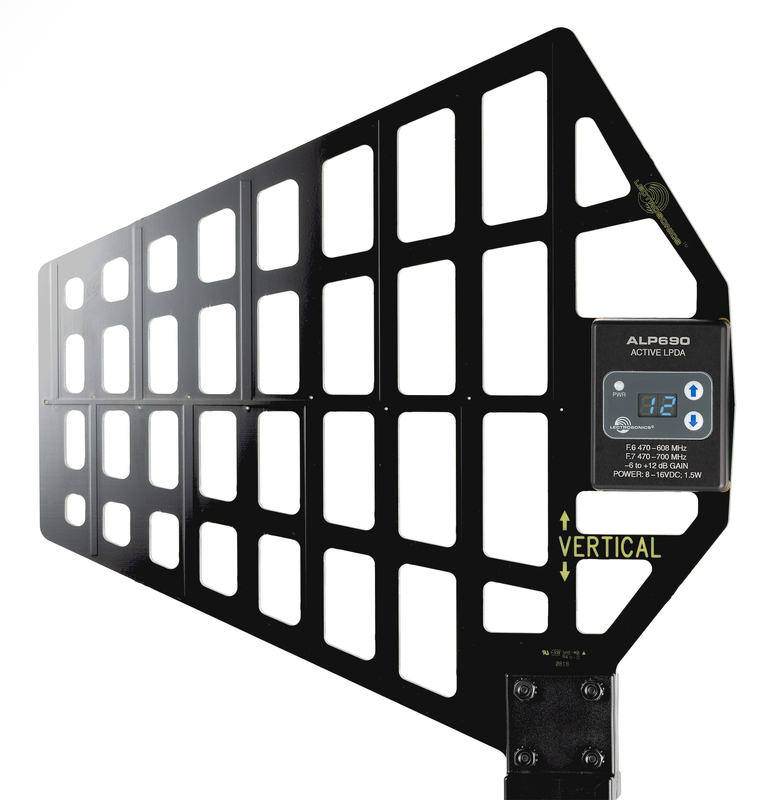 The ALP690 is a high-performance UHF LPDA (Log Periodic Dipole Array) antenna with a built-in RF amplifier. 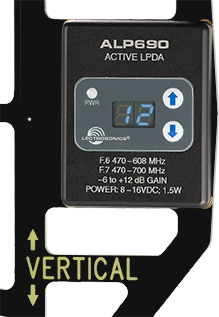 It delivers +4 dB of passive gain in a directional pattern to extend operating range, and the RF amplifier can be engaged to supply -6 to +12 dB of gain (adjustable in 1 dB steps) to offset cable RF loss, depending on the type and length of coax cable in use. New with this model is the addition of a membrane switch keypad and LED readout on the control panel, great for quickly adjusting RF amplifier gain, filter bandwidth, and display brightness when working in low-light environments. As an active antenna, the ALP690 operates with a broad bandwidth to accommodate multi-channel systems. The filter bandwidth is adjustable from 470 MHz at the lower end to either 608 or 700 MHz at the top end, for use in the US market or abroad. Vertical orientation provides a wide horizontal coverage pattern. The antenna is powered via DC bias inserted on the coaxial cable, connected to the 50-Ohm BNC jack. This power can be supplied by a Venue Series receiver, an active multicoupler, or an inline BIAS-T device. The unit automatically switches to passive mode when no DC power is present on the coaxial cable, allowing you to use it not only for receivers but for IFB or IEM transmission applications, as well. The ALP690 is formed with copper traces on a .133"-thick glass-epoxy, high-pressure, thermoset plastic laminate material. Ideal for indoor/outdoor use, it features a durable, weather-tolerant finish and a skeletal structure that reduces wind loading. Versatile mounting options include the supplied mount and the optional mounting adapter kit, which allow you to mount the ALP690 horizontally or vertically and position it away from nearby reflective surfaces to preserve the natural pattern of the LPDA design. So, if you've been thinking of putting the right antenna in the right place to enhance the reception for your wireless system, the sophisticated ALP690 might be the right tool for you. Please come visit us at our SuperStore and have one of our audio experts tell you more about this product, or simply click to our B&H website and read more.